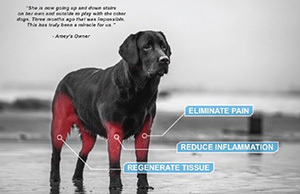 Our typical patient has osteoarthritis (hip dysplasia, degenerative joint disease, calcifications, common degeneration and inflammation), soft tissue injuries (cruciate injuries, tears, ruptures, inflammation), or needs accelerated healing of fractures. 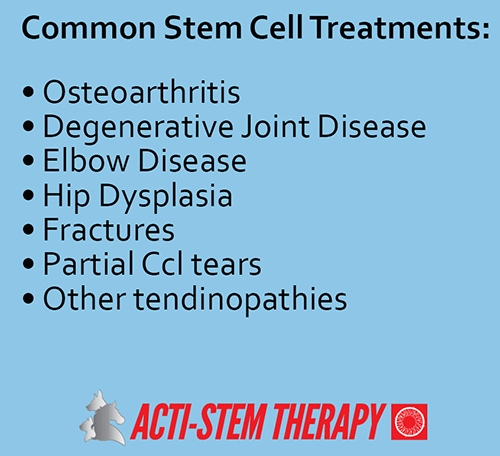 We know a lot about these conditions, and over 95% of these patients get better, with MediVet’s Stem Cell Therapy. We also treat other cases under “compassionate use”. We know less about these conditions, but are seeing some exciting results. Some of those conditions are: degenerative myelopathy, feline gingivitis, end-stage renal disease, liver and kidney failure, allergy, auto-immune, inflammatory bowel disease, pulmonary fibrosis, IMHA, atopy, and spine trauma. Please talk to your vet if you have questions about any of these conditions.